The first poster for Ocean's Eight is here. It's hard to think of a better heist movie than Steven Soderbergh's Ocean's Eleven, which spawned two sequels and made a boatload of money at the box office. Warner Bros. is looking to keep the franchise going with the female-driven Ocean's Eight. Now, the studio has unveiled the first poster for the movie, which leans into the stacked, all-female cast, led by Sandra Bullock. While we haven't seen any footage from Ocean's Eight just yet, this poster offers a rather reassuring first look. The poster is very sleek and features a whole lot of red. 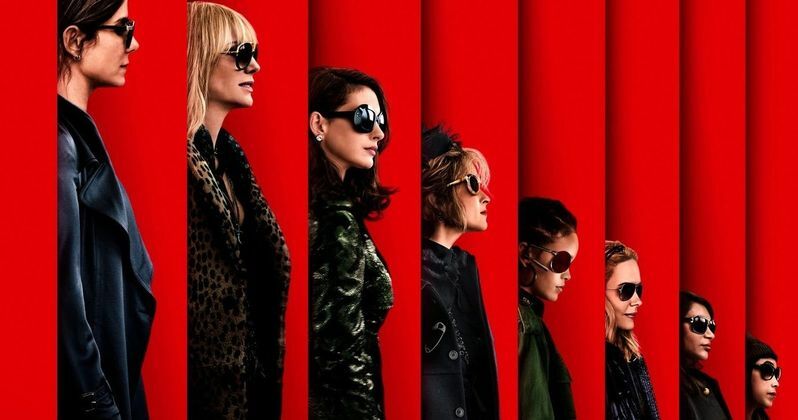 Sprinkled in with that red is the eight, core female stars of the movie, who are led by Sandra Bullock, who serves as the connective tissue to the other Ocean's movies, as the sister of Danny Ocean (George Clooney). In a recent interview with EW, Bullock assured everyone that this is not a reboot. "We're not a reboot. We're just a 'this is what's happening in 2017.' It's not even a passing of the torch. It's a parallel story of another family member that was raised in the same family Danny Ocean was and what happens when Debbie steps out of jail with all of these amazing, powerful women." Unfortunately, Steven Soderbergh didn't come back to direct Ocean's Eight. He is, however, still on board as a producer. Instead, it's Hunger Games and Seabiscuit director Gary Ross at the helm. He directs from a screenplay he co-wrote with Olivia Milch (Dude). Ocean's Eight is poised to be one of the big offerings from Warner Bros. for summer 2018, as the movie has a prime release date on June 8, 2018. Ocean's Eleven, Ocean's Twelve and Ocean's Thirteen made a combined $1.1 billion at the box office, so the studio has plenty of reason to think these ladies can break the bank next summer. The new crew for Ocean's Eight includes Debbie Ocean (Sandra Bullock), Lou (Cate Blanchett), Nine Ball (Rihanna), Amita (Mindy Kaling), Constance (Awkwafina), Rose (Helena Bonham Carter), Daphne Kluger (Anne Hathaway), and Tammy (Sarah Paulson). The movie also features Matt Damon, reprising his role as Linus Caldwell, with Carl Reiner also said to have a cameo as his Ocean's Eleven character. The cast also includes James Corden and Dakota Fanning, with Kim Kardashian, Kendall Jenner, Anna Wintour, Adriana Lima and Katie Holmes all said to have cameos. With the first poster for Ocean's Eight arriving, and the release date about six months away, it seems likely we'll see a teaser trailer arriving online very soon. So be sure to keep your eyes peeled for that. For now, check out the first poster for Ocean's Eight, which boasts the tagline, "Every con has its pros," courtesy of star Sarah Paulson's Twitter, for yourself below.